This sterling silver mens bracelet is made with square wire and 2 twist wires going down the center. It has 3 handcut rectangle turquoise stones on top that are approximately 5/8" long by 1/2" wide each. 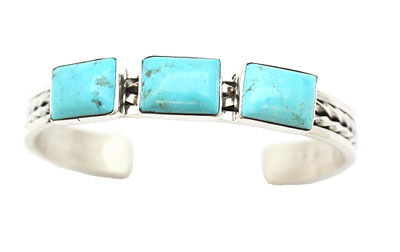 It has a satin finish and is made by Navajo artisan Bobby Becenti. ** One available in green and one available in blue. ** Choose color when ordering.